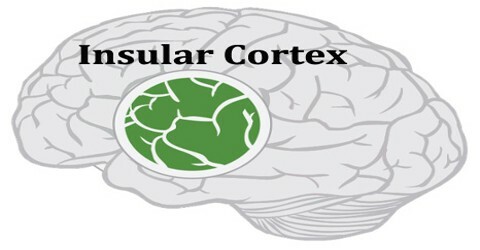 Insular Cortex (IC) may play a role in the integration of visceral reactions and stress. It is a portion of the cerebral cortex folded deep within the lateral sulcus, the fissure separating the temporal lobe from the parietal and frontal lobes. The insulae are believed to be involved in consciousness and play a role in diverse functions usually linked to emotion or the regulation of the body’s homeostasis. These functions include perception, motor control, self-awareness, cognitive functioning, and interpersonal experience. In relation to these, it is involved in psychopathology. The insular cortex lies hidden deep to the lateral sulcus (sylvian fissure), which separates the frontal and parietal lobes dorsally, from the temporal lobe ventrally. The overlying cortical areas formed by the frontal, parietal and temporal lobes are known as opercula (meaning “lids”). The insula is a sessile irregular pyramid, with its trapezoid base facing medially. The base is circumscribed by the circular sulcus, although more precisely this is formed by four periinsular sulci; anterior, inferior, superior and posterior. Its apex points laterally, into the sylvian fissure. 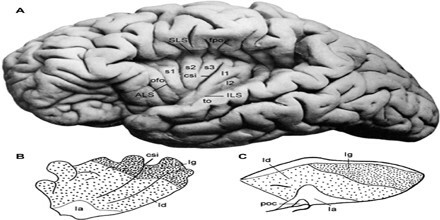 The insular cortex is divided into two lobules, anterior and posterior, by the central sulcus of the insula which passes obliquely from posterosuperiorly to anteroinferiorly. The insula, Latin for “island” and also called the Island of Reil or the insular cortex is a triangular area of neocortex that lies underneath the lateral (Sylvian) fissure. 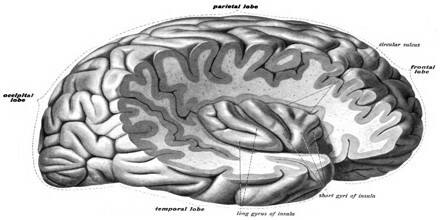 The insular cortex is not visible on an exterior view of the brain, as it is fully covered laterally by opercula of the parietal, frontal, and temporal lobes. The anterior insula receives a direct projection from the basal part of the ventral medial nucleus of the thalamus and a particularly large input from the central nucleus of the amygdala. In addition, the anterior insula itself projects to the amygdala. The posterior insula connects reciprocally with the secondary somatosensory cortex and receives input from spinothalamically activated ventral posterior inferior thalamic nuclei. The central sulcus of the insula is the most inferior extension of the Rolandic fissure (central sulcus) that separates the frontal and parietal lobes. The central sulcus is the dividing line between the anterior and posterior sectors of the insula. Posterior to the central sulcus is an area of cortex comprised of the two long posterior insular gyri. Development – Insular cortex is considered a separate lobe of the telencephalon by some authorities. 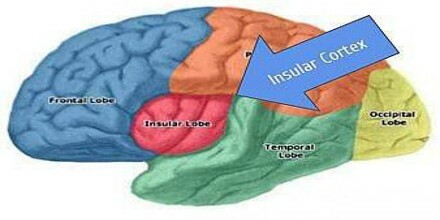 Other sources see the insula as a part of the temporal lobe. It is also sometimes grouped with limbic structures deep in the brain into a limbic lobe. As a paralimbic cortex, the insular cortex is considered to be a relatively old structure. The starting point for a more detailed understanding of functional anatomy in the human is provided by studies in nonhuman primates. It is important to bear in mind, however, that differences are apparent both when comparing across species of nonhumans primates and from nonhumans primates to humans. It has a number of disparate functions, serving as the primary gustatory cortex, as well as having important connections to language and visual-vestibular integration. Additionally the insula also has important autonomic function, particularly sympathetic tone from the right insula; damage to this area has been associated with cardiac arrhythmias.